After some work I have given up on having a clever inheritance system for aspect in my Nuuchahnulth grammar. But I want to run this by other grammar engineers to see if I am missing something. Below is my current understanding of the morphology and perfective/imperfective split of Nuuchahnulth verbal aspect. There are some obvious generalizations here: Anything that is graduative can become perfective, for instance. Initially I had a hierarchy where that bottom row of perfective forms inherited from the graduative and the other aspect, and specified in the lexical rules that anything graduative could undergo perfective morphology (and the inheritance would sort out what the full aspect was). But this doesn’t quite work because I need (for other components of the grammar) to distinguish between perfective and imperfective aspect types. There are two aspect forms that are perfective—the momentaneous and the inceptive—which can become imperfective through the application of the graduative template, and then perfective again through the perfective (or “momentaneous”) morpheme being reapplied. I don’t think there’s a way to have an inheritance hierarchy that both captures the generalization about graduative forms becoming imperfective that also is able to group the bottom row of *-graduative-perfective forms with the momentaneous and inceptive. I’ve torn out the clever hierarchy and just have all the forms listed here, and each node separately inherits from a perfective or imperfective type. I want to check with other engineers that there is no clever way of generalizing over the perfective/imperfective hierarchy together with the morphological pathway of verbal aspect that I’m missing. I have a hard time reading this figure because I can’t tell wht the nodes in the graph are. They seem to be a mix of aspect names (semantic ASPECT values? ), actual morphemes, and morpheme glosses. Can you clarify? Well the ASPECT values can be defined by me. Right now, yes, each node represents an ASPECT value in the semantics. The transition from one point to another (along the arrows) follows particular morphemes that attach to stems (and thus i-rules). Any node that is not the root node is a valid word form. Of course the ASPECT values are as you define them. I’m just trying to understand when you say “hierarchy” are you talking about a hierarchy of ASPECT values or of lexical rule types? And to point out that these don’t have to be parallel. 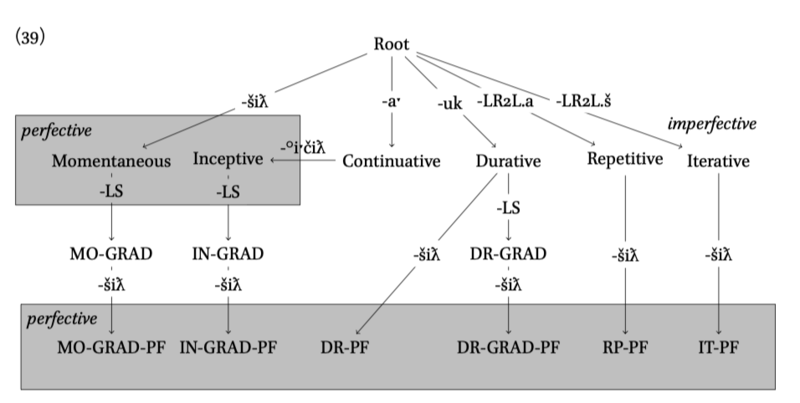 Regarding the diagram: All of `Root’, -LS, -uk, Momentaneous, etc look like ‘nodes’ to me. I guess some are actually interrupting the arrows and some are pointed at by the arrows. But I’m still not able to read this, even noting that. Are ‘Momentaneous’ and ‘IN-GRAD’ both the same kind of thing in the graph? The hyphenated bits (-LS, -uk, etc) are meant to be segmental phonology that defines the morphemes. The nodes that are Momentaneous, DR-GRAD, etc are meant to be the same kind of thing: forms built up by the application of morphology, which starts with root. E.g., a root form might be č̓it ‘cut’, which then can add -šiƛ and become č̓itšiƛ, which is in the momentaneous aspect ‘cut’. This can become graduative through the application of -LS which (when the morphophonology is resolved) is č̓iitšiƛ ‘cutting’, and may then go through another rule making it perfective again, č̓iitšiƛšiƛ ‘start cutting’. The aspect value of each of these verb forms needs to be different (I think) to show that these mean different things. So there are three possible complete word forms on this path, the momentaneous č̓itšiƛ, the momentaneous graduative (abbreviated MO-GRAD) č̓iitšiƛ and the momentaneous graduative perfective (MO-GRAD-PF) č̓iitšiƛšiƛ. This pathway shows the derivation of morphological forms one from the other, and the nodes are meant to represent different aspects. Now I thought ASPECT could be organized in a hierarchy such that I didn’t have to define 15 unique nodes inheriting in a flat manner from the top node of aspect, but rather could have, e.g., the bottom tier inherit from a generic perfective and a generic graduative, as well as the top tier nodes. But I haven’t found a way to do this, because of the problem where I need the momentaneous to be perfective, the momentaneous-graduative to be imperfective, and the momentaneous-graduative-perfective to be perfective again. These perfective/imperfective values matter in other places in the grammar. So right now, each of those nodes in the diagram represents a separate ASPECT type that is not related to the other types. The ASPECT type hierarchy has two parents nodes: perfective and imperfective, and then 15 types that inherit from one of these. These 15 types are the ones actually assigned to verbs via i-rules, and the nodes in the graph. I dislike this, but I don’t know of another way to get the perfective split (represented by the grey boxes). If the idea is that ASPECT is a feature that takes something from the aspect hierarchy as its value, and that each successive addition of a morpheme changes that value … you run into the problem that semantic information is supposed to be monotonic. The INDEX of the verb is copied up at each point, and you can’t copy the INDEX value while changing the ASPECT value inside of it. So setting aside for the moment the distribution of perfective/imperfective — what are the values that you want to see in ASPECT for e.g. IN-GRAD and IN-GRAD-PF? As for perfective/imperfective: What is your test for this distinction? I thought the value for ASPECT for IN-GRAD should inceptive-graduative, and IN-GRAD-PF should be inceptive-graduative-perfective. I don’t know where else the information for this goes in the semantics. The test for perfective/imperfective is certain types of serial verbs which must agree in perfectiveness. E.g., they can take two verbs that end with graduative morphemes, or two that end with perfective morphemes, but not one that ends with a graduative and one that ends with a perfective. I’m beginning to wonder if I can side-step all of this by having only the first set of forms be verbal aspect (momentaneous, inceptive, continuative, durative, repetitive, and iterative). Momentaneous and inceptive inherit from perfective, and the rest from imperfective. Then the graduative can be an event “wraps” the verb (so INDEX now points to an event variable of a semantic entry (_grad_v_rel?)) and this is specified to be imperfective. Then the final perfective entry is a different -šiƛ that does the same thing and has its ASPECT set to perfective. I have been arguing for a while that there is a separation between the “first set” of morphological aspect forms and the later ones (notably that the first set is entirely lexicalized and unpredictable, but graduative/final perfective forms apply productively). Yes, I think that’s is a good idea. I know that previous work (Francisco Costa’s thesis, for example) argues for treating aspect in the semantics as separate EPs. This would be a bit of a hybrid between that and a feature-based approach, but that’s fine. The other possibility is keeping track of the perfective/imperfective as a HEAD feature on the verb. Then I can do whatever in the event’s ASPECT (momentaneous-graduate-perfective) but in order to coordinate verbs based on perfectiveness, I’ll check in HEAD.PERFECT rather than in ASPECT. I like this solution rather less but it’s much easier. An update for those curious: The semantic system for aspect I have implemented looks is described below, and I was aided by Emily in this. Apologies for the messy tikz images. Aspect is broken into two types: meaning and xperf. [PERF +|-] comes from types under xperf, and all the actual forms (the bottom two rows) inherit from the appropriate xperf type and then the meaning. So this defines all the potential aspectual combinations in the language. So there is a lexical rule that adds no phonology that rounds out the momentaneous & momentaneous graduate aspects.